13th March 1938 Austrian Jews persecuted Following Anschluss which joined Germany and Austria, Jews in Austria were persecuted and victimised. 9th November 1938 Kristallnacht A night of extreme violence. Windows of Jewish shops all over Germany and Austria smashed. 12th November 1938 Jews fined Jews were made to pay one billion marks for the damage caused by Kristallnacht. 23rd November 1939 Yellow Star introduced Jews in Poland were forced to sew a yellow star onto their clothes so that they could be easily identified. Early 1940 European Jews persecuted Jews in German occupied countries were persecuted by the Nazis and many were sent to concentration camps. July 1941 Einsatzgruppen The Einsatzgruppen (killing squads) began rounding up and murdering Jews in Russia. 33,000 Jews are murdered in two days at Babi Yar near Kiev. 8th December 1941 First ‘Death Camp’ The first ‘Death Camp’ was opened at Chelmno. 29th January 1943 Gypsies sent to camps An order was issued for gypsies to be sent to concentration camps. 19th April – 16th May 1943 Warsaw Ghetto Uprising An order was issued to empty the Warsaw Ghetto and deport the inmates to Treblinka. 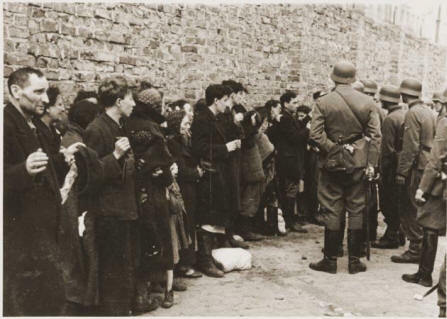 Following the deportation of some Warsaw Jews, news leaked back to those remaining in the Ghetto of mass killings. Late 1943 ‘Death Camps’ closed With the Russians advancing from the East, many ‘Death Camps’ were closed and evidence destroyed. 27th January 1945 ‘Death Marches’ Many remaining camps were closed and evidence of their existence destroyed. 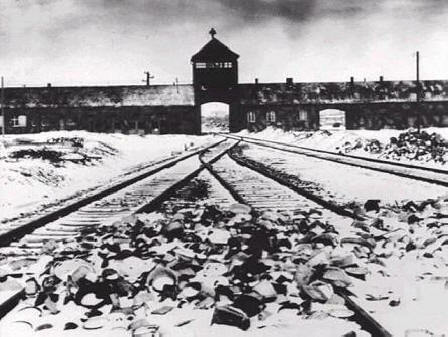 Those who had survived the camps so far were taken on forced ‘Death Marches’.